Or Select a Category Above for More Options. Homeland Security recently issued a warning that we need to prepare for a Zombie Apocalypse! The point they're trying to make is that if one is prepared for a Zombie Apocalypse, they'll also be prepared for any emergency or disaster that might rear it's ugly head. Most people buy insurance to protect their family and property from a sudden, unexpected disaster. It's a prudent and rational response to our uncertain world. Anyone without the provisions needed to provide for life's basic necessities is living life dangerously. But hey, some people enjoy the thrill of living on the edge. The 7Day Ultimate Food Storage Kit is designed to fulfill one of our most basic needs. 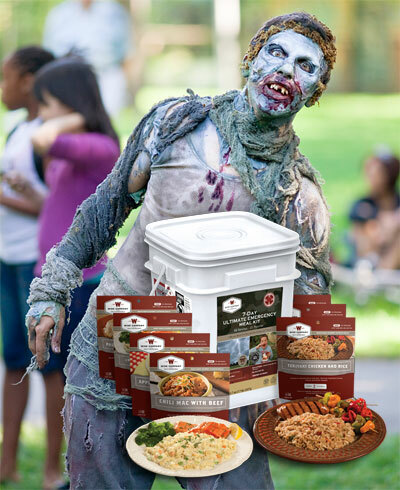 Stock up because the food tastes so good, the Zombies will want you to share! Be ready anytime, anywhere. Get one for your home, your office and your car. 3 Hearty Meals Per Day for One Person for 7 Days. More than 2,000 calories and 100 grams of protein per day. 58 total servings. Real meat high in Protein. Real Food All the Time . . . Also, great for Hunting, Camping, Hiking -Simple, just add boiling water directly into Pouch (no cook). Shipped in a Grab n Go Container. At Food Storage Guys, we offer delicious, quick-fix meals made from the highest quality, all natural vegetable and meat products. A state-of-the-art dehydration process is used, meaning our food is generally free of the harmful additives and preservatives found in many processed food products on the market today. You will know that you are feeding your family great tasting and nutritious food that's a snap to prepare. *FREE Shipping applies only to the Continental United States. Please call 888-683-5507 for shipping rates to Alaska, Hawaii and international destinations.